After an incredible victory over mind, matter, and marathons – Lanni Marchant, and Krista Duchene set the COC on it’s head with their record breaking finishes last Sunday. This is as much a story about the human spirit, as it is about sport and fitness. Instead of a straight up fitness post, this week, I offer you a little inspiration, in the form of two incredible athletes that refuse to take no for an answer. TORONTO — Lanni Marchant was taking her first steps when Oshawa, Ont., native Sylvia Ruegger set Canada’s record time in the women’s marathon in 1985. On Sunday, the 28-year-old took that mark and beat it. 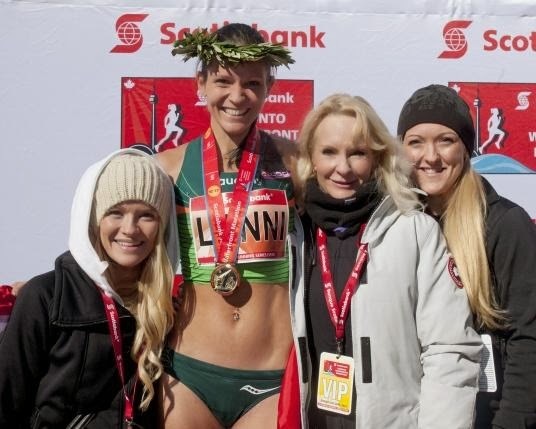 Marchant set the new Canadian record at the Toronto Waterfront Marathon with a time of two hours 28 minutes, besting Ruegger’s mark of 2:28:36. Krista DuChene of Brantford, Ont., crossed the finish line 32 seconds after her Canadian teammate, clocking in at 2:28:32 to also beat Ruegger’s time. Marchant will take home $8,000 in prize money plus a $28,000 bonus for her record-breaking time. 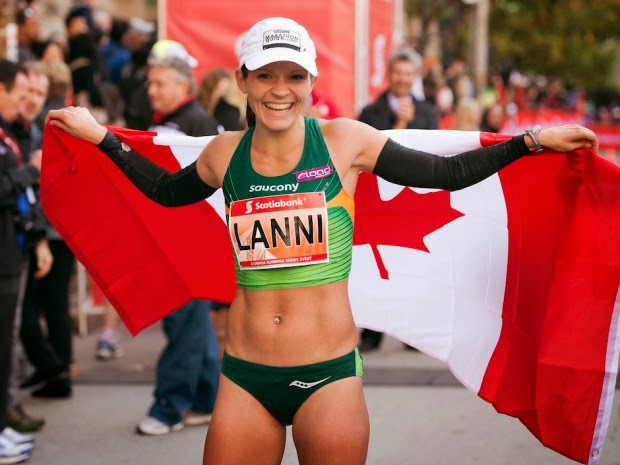 The London, Ont., native placed 44th at the women’s marathon at the world track and field championships in Moscow last summer after experiencing significant cramping in the left side of her body. Frank Gunn/The Canadian PressLanni Marchant celebrates as she crosses the line to set a new Canadian record at the Toronto Waterfront Marathon. She said she thought about her experience in Moscow during the Toronto race. “My calves didn’t cramp as bad as the worlds, but they definitely started to hurt. … After the first 10 kilometres I though, ‘OK, you are feeling alright. Stay with the group until 20 km.’ And then 20 km came and then 30 km,” Marchant said. Prior to the Moscow event, Canada had not had a woman run the distance at a world championship since Tara Quinn-Smith in 2009. Marchant and DuChene represent a resurgence in the sport among Canadian women. DuChene, who clocked a personal best at the Toronto event, said she was happy to be running alongside Marchant through most of the race. Natasha Wodak of Port Moody, B.C., ran a 2:35:16 in her marathon debut. Eric Gillis of Antigonish, N.S., was the top Canadian male in 2:11:47, while Rob Watson of London, Ont., set a personal best of 2:13:27. Gillis was the favourite to win the $38,000 bonus offered to anyone who could break the Canadian men’s record of 2:10:09 set by Jerome Drayton 38 years ago. “Somewhere in the last five kilometres I really slowed down,” Gillis said. “I had the best first half of a race I have ever had. In the men’s race, Deressa Chimsa from Ethiopia finished first with a time of 2:07:05, the fastest time ever run on Canadian soil, while Flomena Cheyech became the new women’s champion with a time of 2:25:13.